Erected 1932 by New York State Education Department. Location. 42° 57.371′ N, 73° 19.104′ W. Marker is in White Creek, New York, in Washington County. Marker is at the intersection of North Hoosic Road and County Route 68, on the right when traveling north on North Hoosic Road. Touch for map. Marker is at or near this postal address: 171 North Hoosic Rd, Eagle Bridge NY 12057, United States of America. Touch for directions. Other nearby markers. At least 8 other markers are within 2 miles of this marker, measured as the crow flies. Site of Home of John Wood (approx. ¼ mile away); New Hampshire Regiment (approx. 1.4 miles away); Vermont Rangers (approx. 1.4 miles away); Bennington Battlefield (approx. 1.4 miles away); Massachusetts Volunteers at Bennington (approx. 1.4 miles away); A Gathering Storm (approx. 1.4 miles away); Bennington Battle Field (approx. 1.4 miles away); “the first link in the chain of successes which issued in the surrender at Saratoga ...” (approx. 1.4 miles away). More. 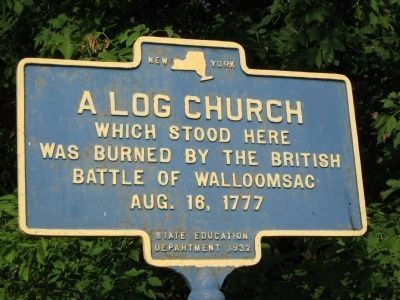 Search the internet for A Log Church. Credits. This page was last revised on March 1, 2019. This page originally submitted on August 17, 2012, by Tom McGreevy of Averill Park, New York. This page has been viewed 338 times since then and 23 times this year. Last updated on March 1, 2019, by Steve Stoessel of Niskayuna, New York. Photo 1. submitted on August 17, 2012, by Tom McGreevy of Averill Park, New York. • Andrew Ruppenstein was the editor who published this page.